If you remember, I applied them Friday mid-day and wore them throughout my Disneyland vacation. I must say, they still look nearly as perfect as when I first applied them. You can see a tiny bit of wear in the gel top coat on my middle finger near the cuticle, but I have a feeling I could touch that up with another layer of clear gel easily. Also, the gel has become a TINY bit scuffed on most of my fingers, but it's not noticeable unless you're looking at them up very close. Scrangie shows the chrome finish wearing off and being very scratched after five days of wear, so I think the gel top coat helped IMMENSELY. I would recommend ALWAYS putting some sort of protective top coat over chrome or mirror nails to protect the finish. It seemed to work wonders in my case! The second half of my review is actually of the Super Adhesive Tabs that I bought at Ulta. They claim to be water resistant and can last up to 7 days. In this case, I've only had them on for 3-4 days, but I really don't see any deterioration at all yet. These nails are stuck on good! Granted, the fake nails I'm wearing are filed down to nearly my natural nails' lengths on most fingers, so there's not much of a "free edge." If they were longer they might have more of a tendency to pop off, I don't know. I also like that there is not much "give" in the adhesive. They pretty much don't budge, so you don't get that weird feeling of the nail getting pushed into your cuticle when you press on something (if you've ever worn fake nails, you probably know what I'm talking about). Right now as I'm typing, they feel like my natural nails to me. The adhesive tabs create a tiny bit of a gap around the edges (between your natural nail and the fake nail) where lint can get stuck. I guess my only wish is that they could make both the adhesive tabs and the nails themselves a bit thinner to give a more natural look. Other than that I loved these SO much and have ordered more because they were so fun! I was surprised the adhesive lasted so well, even through showers and dishes and Splash Mountain! Adhesive that claims to be easily removed with "warm water" will NOT last and won't hold the nails in their proper place very long (they seem to "slide" around on the nail quite a bit). Be sure to get ones that can handle multiple days worth of wear and are water resistant. An alternative is to use nail glue, but it can be more difficult to remove, especially if you'd like to keep the fake nails for future use. Mirror/chrome finishes are VERY susceptible to scratches and wear and it's very important to put a clear top coat over the nails to protect the perfect shiny finish! The adhesive tabs are somewhat long and can be trimmed with clippers to the length of the natural nail before sticking on the fake nail. This makes it so there's not too much exposed adhesive to gather dirt and lint, etc. For more info on the products reviewed in this post, see my original Mirror Nails post. Wow... amazing! They still look good! Mirror nails sounds & looks awesome! I miss Disneyland. It's amazing how after all these days they look so good! 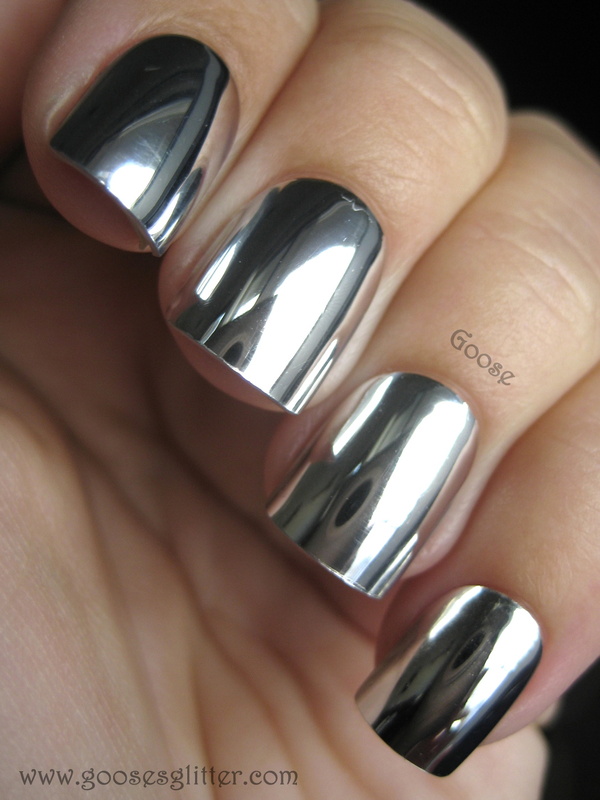 These are the best silver nails I've seen. They actually look metallic rather than glittered. Love it! where did you purchase the things to make your nails look like this? what is it? is it minx nails? Would it work to use an efile to thin them underneath before applying for a more natural fit? Might help the adhesive too . Can u get that in nail Polish? I bet these would be super awesome with a tint over them.